Ready for a great, fun evening? 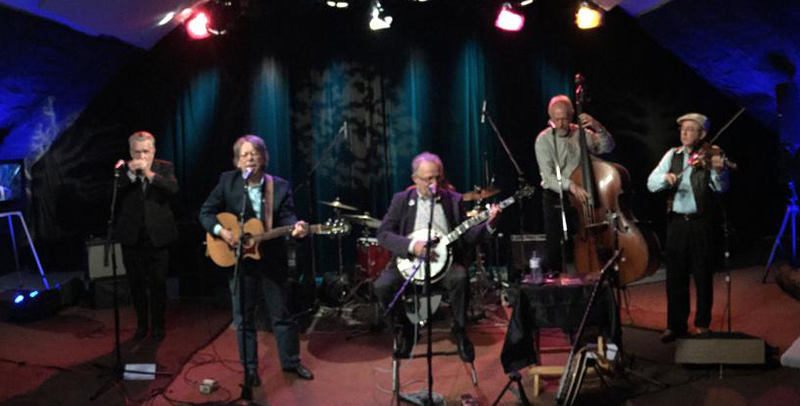 Whiskey Jack has become one of the most celebrated Roots / Country / Bluegrass bands in Canadian music history. For over four decades, Whiskey Jack has performed their own unique brand of Canadian country music coast to coast. In the 1980’s, they were featured weekly on CBC TV’s Tommy Hunter Show. While watching Whiskey Jack’s segment “The Ol’ Back Porch” on The Tommy Hunter Show on Friday nights, a retired Stompin’ Tom Connors became an avid Whiskey Jack fan, enjoying their humour and amazing musicianship, along with two million fellow Canadians. When Stompin’ Tom resumed his career after a 13 year break, he called up Whiskey Jack and invited them to join him in the studio to record his acclaimed album, “Dr. Stompin’ Tom… Eh?”. Stompin’ Tom and Whiskey Jack continued to perform and record together until Tom’s death in 2014. Throughout the years working with Stompin’ Tom, Whiskey Jack developed and refined the present show they tour with today: “Stories & Songs of Stompin’ Tom”. Whiskey Jack’s members include founding band leader, Duncan Fremlin Vocals and Banjo, Two- time Juno Award- Nominee Douglas John Cameron Vocals and Guitar/Accordion, Five- time National Bluegrass Fiddle Champion, Randy Morrison Fiddle, Eric Jackson Bass and Al Cross Drums. Come out and enjoy as Whiskey Jack presents this concert that will delight and entertain audiences of all ages and musical tastes. Tickets $25 Age 16 and younger free!